Forget the frosted cupcakes, and say hello to Pineapple Upside-Down Cupcakes. 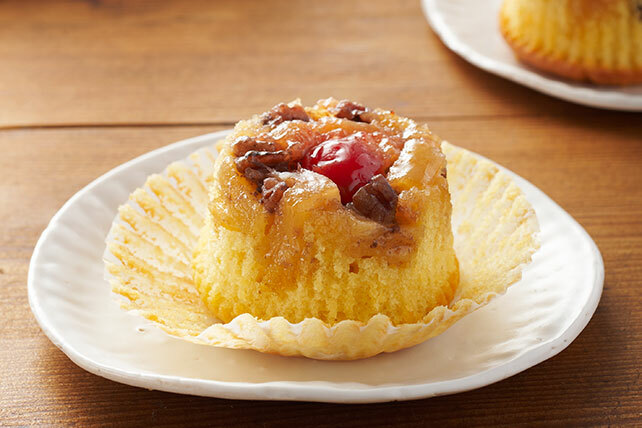 Fruit and lemon cake make these Pineapple Upside-Down Cupcakes a crowd-pleaser. Add boiling water to gelatin mix; stir 2 min. until completely dissolved. Cool 10 min. Meanwhile, mix sugar and butter in medium bowl; stir in pineapple and nuts. Place cherry half, cut side up, in center of each of 24 paper-lined muffin cups. Cover with pineapple mixture. Bake 15 to 18 min. or until toothpick inserted in centers comes out clean. Cool in pans 10 min. ; remove from pans to wire racks. Cool completely. Invert onto plates just before serving; remove paper liners.